(PhysOrg.com) -- Each year, coal-burning power plants, steel factories and similar facilities in the United States produce more than 125 million tons of waste, much of it fly ash and bottom ash left over from combustion. Mulalo Doyoyo has plans for that material. With broad potential applications and advantages such as good insulating properties and fire resistance, the “green” material could replace concrete, wood and other materials in a broad range of applications in construction, transportation and even aerospace. Fly ash is composed of small particles removed from combustion gases by pollution control systems. Most of it must now be disposed of as a waste product, though certain types of fly ash can be used to replace a portion of the cement used in conventional concrete. Cenocell, produced from either fly ash or bottom ash in a reaction with organic chemicals, requires none of the cement or aggregate – sand and rock – used in concrete. And unlike concrete, it emerges from curing ovens in final form and does not require a lengthy period to reach full strength. 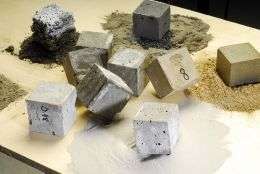 “This is a new material very different from concrete,” Doyoyo said. Because it uses what is now considered a waste material to replace cement – which generates carbon dioxide, a greenhouse gas – the new material is considered an asset to the environment. The material can have a wide range of properties that make it competitive with concrete, especially the new classes of autoclaved lightweight concrete. For instance, specific densities range from 0.3 to 1.6, and the material can be manufactured to withstand pressures of up to 7,000 pounds per cubic inch. The properties can be controlled by choosing the proper ash particles size, chemical composition, and the curing time, which can range from three to 24 hours. -- Building and construction industry – infrastructure materials that provide sound, crash and fire barriers; permeable pavements; drainage fillers; ultra-light truss stiffeners, foam, wood and concrete replacements in residential and commercial buildings; and acoustical tiles. Cenocell is lighter than most “lightweight” concrete, and lightweight versions can be machined and cut with standard band saws. -- Transportation industry – cores for shock and crash absorbers; fillers for trailer floors or b-pillars in vehicle frames. -- Aerospace industry – ultra-light heat shielding. -- Protective installations – fireproof blast walls or structural fillers for hazardous fluids. Though for competitive reasons he won’t disclose the precise chemical composition of Cenocell, Doyoyo says the processing involves mixing the ash with organic chemicals. The chemical reaction produces foaming, and results in a gray slurry that resembles bread dough. The material is then placed in forms and cured in ovens at approximately 100 degrees Celsius until the desired strength is attained. Unlike concrete, which remains a mixture of materials held together by chemical bonds, Cenocell is a homogenous material. The cell sizes and final strength depend on both the curing time and size of the ash particles used. Estimates suggest the material could be manufactured for an average cost of $50 per cubic yard. Doyoyo and his research team – which also includes Paul Biju-Duvall, Julien Claus, Dereck Major, Rolan Duvvury and Josh Gresham – have so far made only small samples for testing. They are working with a Georgia-based maker of autoclaved concrete to produce larger samples for additional testing. Large-scale manufacturing could be done with the same equipment now used to make autoclaved concrete, he says. Doyoyo will present information about the material at the inception workshop of the Resource-Driven Technology Concept Center in South Africa (RETECZA) December 1-3, 2008, and at the World of Coal Ash meeting May 4-7, 2009. A native of South Africa who was educated at the University of Cape Town, Brown University and Massachusetts Institute of Technology, Doyoyo sees value beyond the re-use of a waste material. He believes Cenocell could provide low-cost housing in developing countries and economic development impact from a new industry. "Doyoyo says the processing involves mixing the ash with organic chemicals. The chemical reaction produces foaming"
Sounds like CO2 is being produced to me. Oh god.. CO2 is nothing. CO2 is natural. "Though for competitive reasons he won't disclose the precise chemical composition of Cenocell, Doyoyo says the processing involves mixing the ash with organic chemicals." OF US!! Let proprietary "discoveries"
I object to this sort of stuff.. I am so sick of hearing how such and such is "GREEN". If you look at anything the right (wrong) way you can claim it is green. This stuff requires to be heated to 100C. That requires energy, the raw material comes from burning coal = CO2, etc. the stuff is interesting, but i can do without the BS "GREEN" tag. The other day I saw some wall calendars advertised as "Green" because they were made from recycled paper. A truly green solution would be to not have a calendar, and find the date/plane your schedule on your computer. If you must have a paper wall calendar, get a small one with 1/2 the pages and no big color images. It's all a bunch of marketing crap! Coal fly-ash and bottom-ash is currently a minor disposal problem for the coal companies and it may become an insurmountable one in the future(if coal plants were subjected to the same ridiculous level of scrutiny as nuclear plants, where a release of tritium that exposes nearby inhabitants to the same level of radiation as eating a banana is treated like a holocaust). It's either going to end up in land-fills/waste piles or it's going to end up in some kind of building material, soil embankment and so forth. If improperly disposed of it may leach mercury, arsenic, cadmium, lead and other heavy metals that can potentially contaminate the ground water with levels the EPA considers unacceptable. My guess is that they want to get rid of the huge mountains of fly-ash and bottom-ash so that they can't be forced to treat the ash to remove heavy metals before disposal. You also forgot to mention that flyash is radioactive. Coal is slightly radioactive to begin with and burning it just concentrates the radioactivity in the waste ash. Those building blocks will keep you warm and cosy in winter as well. Coal is slightly radioactive to begin with and burning it just concentrates the radioactivity in the waste ash. It's usually about as radioactive as dirt. The ash can be about 100 times as radioactive as dirt if you find a particularly uranium rich coal vein; but 100 times a very small number is still a very small number. pressure is not expressed as pounds per cubic inch, more like pounds per square inch. Nice information, but to break it down it's not any more environmentally friendly than concrete, and the cost factor is not mentioned. I wouldn't bet on using this material past sidewalks, as it's properties are not superior to cement. This reminders me of The %u201COld Man and Lisa%u201D from %u201CThe Simpsons%u201D it sounds too good to be true. The proprietary "organic" binders used are almost certainly just industry standard thermoset resins, like the polyester resins used to make cultured marble. Of course, properties of the finished product depend on the properties of the waste ash used, as well as the properties of the binding resin. For example, using a polyimide resin would result in a material able to withstand higher temperatures than if it were made with polyester resin. Of course the generic words are probably generic chemicals. The only thing is that the guy wants to keep his details secret so that no one can make money off his idea. If no one else could do it, then he'd be showing it off like nobody's business. Plus, he ignores the fact that concrete is quite often made from waste materials left over from clearing buildings and digging highways. In short, interesting, maybe useful. I'll consider buying stock in a company that takes it large-scale, but I've been given no real reason to buy the stuff.